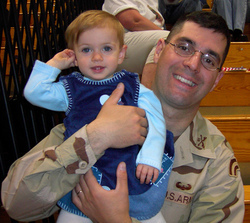 Siobhan Esposito, the widow of Army Captain Phillip Esposito who was murdered alongside 1st Lieutenant Louis Allen in Iraq in 2005 applauds Major General Joseph Taluto's unprecedented decision yesterday to ask for the withdrawal of his nomination to serve as Director of the National Guard. Taluto's withdrawal is due to an investigation Mrs. Esposito instigated examining Taluto's failed leadership as commander of the 42nd Infantry Division of the New York National Guard—a failure Esposito believes directly contributed to the murder of her late husband and the acquittal of his accused killer. "I believe Alberto Martinez murdered my husband, but it was the Army's lax standards that gave him license to do it and then get away with his crime." "Major General Joseph Taluto's withdrawal and retirement," says Esposito, "made before the Deputy Secretary of Defense's report investigating his role in my late husband's death was publicly released is vindication of my call for the Army to properly address the unforgivable lack of military discipline that led to my husband's murder." "Two American heroes like my husband and Louis Allen cannot be murdered in cold blood without those responsible being held to account for it," says Esposito. "I believe Alberto Martinez murdered my husband, but it was the Army's lax standards that gave him license to do it and then get away with his crime." "The Army must learn from these needless and preventable deaths, punish those responsible for them and reform its standards or there will be more deaths like my husband's and Lt. Allen's in the future," says Esposito. "Had the Army learned from its mistakes surrounding my husband's murder, I hold that its leaders could have prevented further tragedies such as the horrific massacre of soldiers at Fort Hood." "I am deeply indebted to Senator Jim Webb for his leadership in support of my quest," says Esposito. "His willingness to support my call for an investigation of General Taluto's conduct helped me and my young daughter secure the first iota of accountability since my husband was murdered in 2005." "No soldier should ever fear his comrades—least of all when there are clear warning signs that demand action," says Esposito. "My act of justice to the memory of my husband will be to fight for reform until the mistakes that lead to the preventable deaths of our soldiers are corrected."